At school I was one of those kids that always tried to come up with a reason why I wasn't able to do PE. Apart from swimming there wasn't much that I really fancied doing and the absolute worst case scenario was the prospect of cross country running. I have no idea how far we were expected to run (probably about a billion miles) but I'm sure it was always without exception snowing or hotter than the surface of the sun on those fateful days... All this makes it all the more surprising that I'm thinking I might be turning into someone who actually LIKES running! As you may know I've been on a bit of a weight loss journey and without a goal weight in mind (I'm in that weird place that this is the thinnest I've ever been as a grown up - probably thinner than the aforementioned cross country period of my life!) so feel a little bit without something to aim for to spurn me on. I've been walking lots since the arrival of my fitbit back in June of last year and I've been mulling over the prospect of kicking it up a notch for the last couple of months. 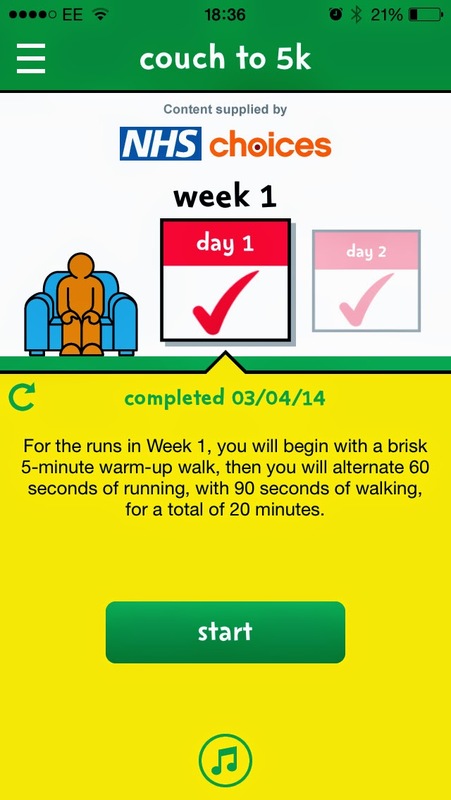 Of course the shabby weather of winter is always rather off putting but with a temperature rise of a few degrees and the need to take my mind off a few things recently I've grabbed the bull by the horns and downloaded the free NHS Couch to 5k app for my iPhone. Download it here. I definitely had some degree of fitness from brisk walking for several miles at a time so can’t say I was quite starting at ‘couch’ but running is definitely a whole new ball game for me. The program is based on the premiss of interval training with runs of varying lengths interspersed with sections of brisk walking. I’ve found this to be a great way to start with running - it gives you encouragement that you are building stamina and gives you small victories along the way. The app is great with a virtual coach called Laura who offers tips, guidance and encouragement every step of the way. She lets you know when to run and when to slow down and is there to encourage you to keep running when you might be flagging. The programme starts gently with 60 seconds of running interspersed with 90 seconds of walking for a total of 20mins bookended by brisk 5 minute warm-up and cool-down walks. This session is repeated three times over the course of a week with a days rest in-between each session to let your body recover. In practice this can mean that you run three times some weeks and four runs on others - strangely I’m quite grouchy on a rest day - I just can’t wait to get out again as soon as possible! I’m currently on week 5 of the programme - renowned to be the week where it steps up a notch with much longer periods of running but still I’m loving it! If you’d told me I’d be typing that just a few months ago I would never have believed it! Stay tuned to my blog for more fitness related posts including some reviews of some new aquistions! Does this mean I'm officially a runner? Signed Up! Race for Life.